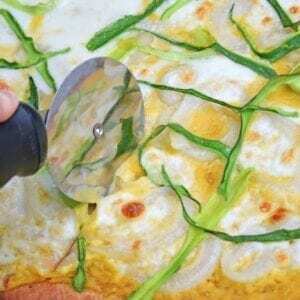 Butternut Squash Vegetable Pizza is an easy homemade pizza recipe! If you're looking for a recipe to switch it up, this is the recipe for you! In a medium saucepan, combine cubed butternut squash and vegetable stock. Heat to a low boil, stirring to evenly cook the butternut squash. In approximately 10-15 minutes the majority of the liquid should be absorbed or evaporated and butternut squash will be soft and tender. Remove from heat. Using an immersion blender or food processor, blend butternut squash with heavy cream, rubbed sage, Kosher salt and ground black pepper. Blend until smooth. Set aside. Follow cooking directions for pizza crust- either pre-packaged or Cauliflower Crust. Crust should already be cooked before adding toppings. Dress your crust starting with a butternut squash cream base. Continue with zucchini shavings, caramelize onions and lastly fresh mozzarella. Cook at 400 degrees for 10 minutes or until cheese is bubbly and brown. Watch closely, depending on your crust, cook times may vary to prevent burning. We love comments over here! If you've tried this recipe, make sure to come back and let us know how it went!